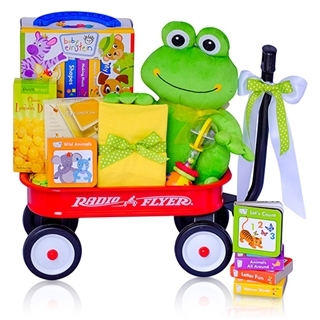 This keepsake gift features Baby Einstein books and a cuddly plush frog in a genuine mini Radio Flyer wagon! The cute plush frog will be a loyal companion as baby's literacy skills are set into play with the included award winning early learning board books. This mini library consists of 12 educational books to teach colors, numbers, shapes, animals, and more. We also include a spin and click rattle for fun, some lemon tea and candies for the parents, and a cotton bib that can also be embroidered with baby�s name to personalize it and make it even more memorable. Great choice for boys and girls as a welcome home gift or baby shower present. Free shipping included.